THE CARAVAN IS NOW ON SPECIAL OFFER !!!! LOW = £65per night min of a 2 night stay. HIGH = £95 per night min of 2 night stay. All prices are due to increase at the end of the month so book now to beat the increase. A £50 Pound ( NON REFUNDABLE APONE CANCERLATION ) to secure your dates plus a refundable £50 deposit for cleaning and damage waiver is required on making a booking this is to be paid by Cheque or Bank Transfer to confirm your booking and the remainder to be paid 6 weeks before your holiday begins. 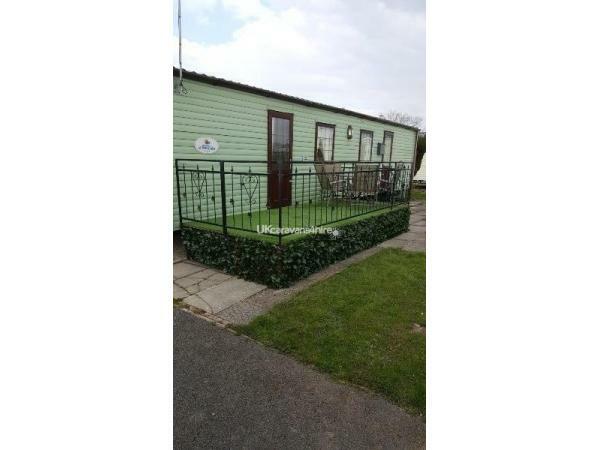 The deposit will be given back within 7 days after your holiday ends if there is no damage to the caravan, the caravan has been left in a clean and tidy condition, no smoking is permited within the caravan at any time and the caravan is as it was when you arrived. (a)If it is 28/14 Days before your holiday a loss of 50% of the hire charge will be made. (b)If it is 14/7 Days before your holiday a loss of 75% of the hire charge will be made. (c)If it is 7 Days before your holiday the a loss of 100% of the hire charge will be made. In the event of a cancelation or the caravan has not been left as found and/or there has been smoking in the caravan from any parties the £50 security bond (The deposit £50)will be NON-REFUNDABLE. £35 per WEEK for a Family pass Low Session and £45 per WEEK High Session (upto 8). All Children under 3 passes are FREE..
Lovely spacious modern south facing Caravan on the Lyons Robin Hood Camp ( NOW ON SPECIAL OFFER !!!!!! ) with all the mod cons that you need to enjoy your holiday. It has Double Glazing and Central Heating for those cosy nights in, there's also a DVD player with lots of films, PS2 games console with loads of games. There are 2 bedrooms, the Main Bedroom having a Double Bed (Linen Provided) built in wardrobes,Hair Dryer,and an En-Suite which has a full size shower. The other Bedroom has two single beds(Linen Provided) built in wardrobes,there's also a Travel Cot(bedding not included)for a small Infant. 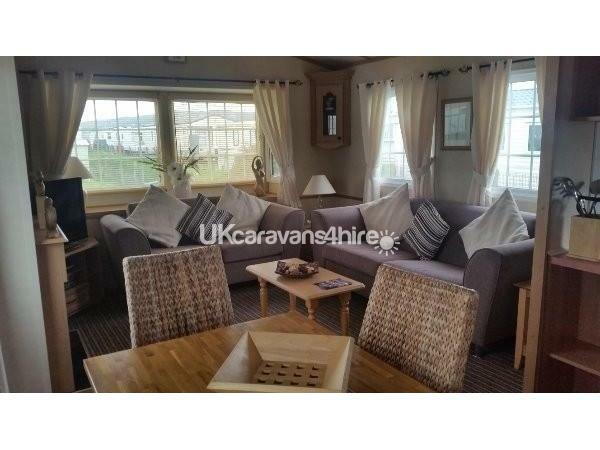 The Living area is very spacious and open plan, it has a 3 and 2 setter couch, TV,Coffee Table and so on the caravan is decorated to a very high standard through-out. The kitchen area is also very modern and up to date with all the modern accessories you would require for its day to day use. All in all this is a Home from Home experience. 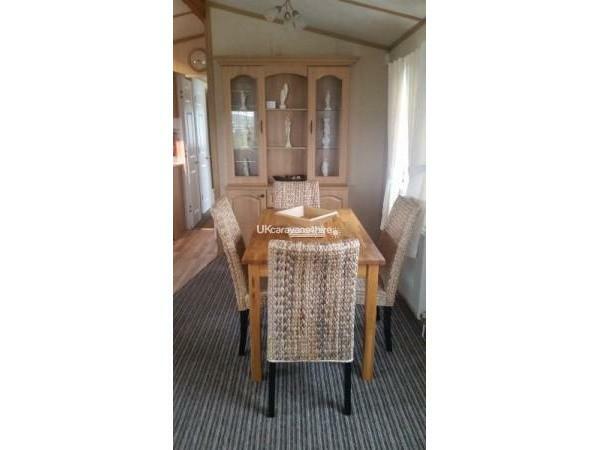 To the outside of the caravan is a lovely child friendly veranda which has a table and chairs for you to sit relax and enjoy the days and nights. All your Gas and Electric is included so no hidden charges also Gas and Electric checks are carried out every 12 months and then certified, all the usall alarms are fitted to the caravan and they are checked weekly for your safety please keep in mind that most off the caravans that are advertised on here are not double glazed or central heated like this one, with all bills included in the price.So from just £45 pound per night for a family of 4 priced on a weeks stay you cant get much better value for your money so come and enjoy a holiday in are splendid home from home. I would recommend that you book as soon as possible as the High Season weeks are being booked fast. As you come into the Lyons Robin Hood Camp the main reception which has been refurbished to a very high standard is welcoming and pleasing to the eye with friendly staff willing to help in any way they can during your Holiday. There are 5 Bars located on the Lyons Robin Hood Camp , there's an Irish Bar with a pool table and dart board which has once again been refurbished to a very high standard along with a new show bar with well known artists this is a Adults only venue also there's a Large Family Showbar that holds the childrens activities during the day and evenings giving you time to relax and watch them have fun then as the night proceeds into the late evening the adult entertainment starts with its bingo and late night disco, next door we have Sherwoods Sports-bar which offers you a great selection of food for all the family this starts from 8.30am serving Full English Breakfast and much more ,there's also over 8 Television Screens and a Large screen which features all the sports you need to see while on holiday here so your not going to miss out on them special Football games. There are various well known Artists who entertain here throughout the camps bars during the High Season. Outside there's a bar to sit and enjoy the sunny days and watch the wold go by. There is also an on-site heated swimming Pool with Jacuzzi and Sauna which has also been refurbished to a high standard,There are Kids and Teen clubs, and for the Little ones there is Little Leos Baby Zone also a brand new pirates crazy golf putting zone . Which is busy in the high season. All bed Linen will be provided fresh and clean on arrival, all you need to bring are your own Towels and Tea Towels this is strictly a non smoking caravan. Arrival time is 14.00 and Departure time is 10.00am. NOW ON SPECAIL OFFER !!!!!!!! Please check out are reviews at the bottom of the web page. Additional Info: THE CARAVAN IS NOW ON SPECIAL OFFER REVEIWS FOR THIS SEASON AT THE BOTTOM OF THE WEB PAGE YOU WANT BE DISAPOINTED. In Sherwoods Bar they are now serving food from 8.30am till 9.00 pm, with a selection of food, including childrens meals ,there's a brand new Irish Bar and Show room with famous entertainers for you to enjoy.The Main reception area as been refurbished and is welcoming and Modern making your first impressions last.. Recently returned from our few days away, had an amazing time would definitely recommend and will be returning. We visited as a group of 3 Middle Aged adults and took out puppy, great for dogs especially with the outside veranda and great in the sun with table and chairs outside and deck chairs. In a great location, in quiet area close to the beach. Also the caravan owners were extremely friendly and helpful top customer service and very handy how owners lived on site so on hand if ever you want to ask about something. 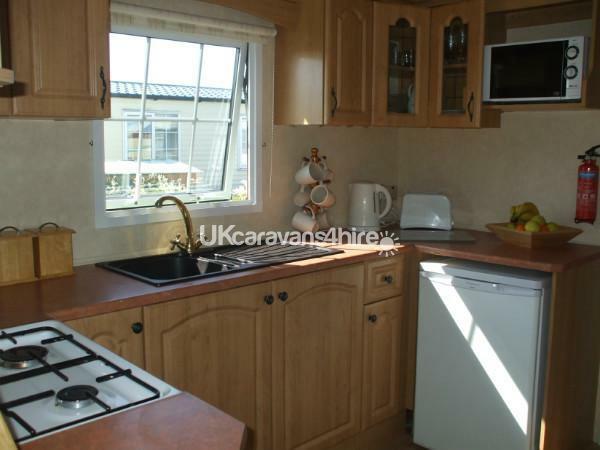 The caravan was extremely clean and spacious and also very modern and beautifully decorated, amazing value for money break away in the uk. Thank you again for the enjoyment of our stay ???? sharon and Charlie. Just returned from a great relaxing family holiday in a very comfortable caravan. We were met on arrival by Andy, who personally took us to the caravan. The van is nice and spacious and tastefully decorated, we found it very cosy. The van also has a great enclosed veranda which was perfect for our pet Labrador to relax on. The site is in a great location and only a 5 min walk to the beach which again was perfect for our dog. Overall we had a very comfortable stay and this was just the relaxing break we needed. We will definitely return and recommend. Very good value. Owners very helpful and only a phone call away if needed but at the same time were respectful of our privacy. Caravan was great cosy and spacious. Close to swimming pool 10 mins walk to beach and kids club probably quicker but my little boy doesn't walk quick. Andy showed us to the van and left us to enjoy are break and told him to contact if needed. Thank you. 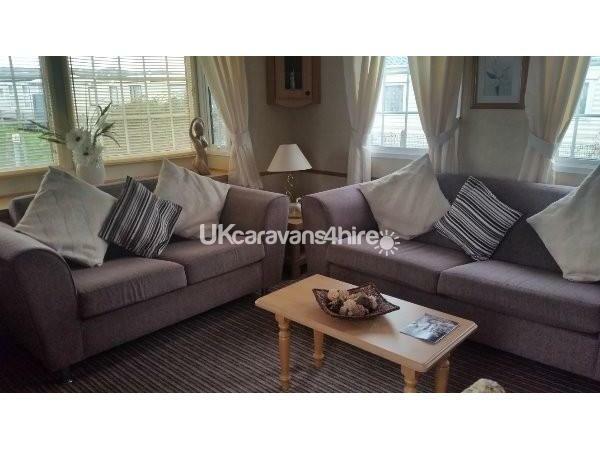 Booked this caravan last minute, Lovely and modern caravan, very comfortable and cosy. Quiet area of the park with a 5 min walk to the beach which was great for us to take our dog. Would highly recommend. We had a great holiday in Andy's lovely caravan. He met use when we arrived to show us around which was nice.It was lovely and clean, well furnished and cosy, especially liked the veranda and the games to keep us amused when the weather was bad. It was in a lovely quiet spot but close to the swimming pool and not far from the beach. It was lovely that we could bring our dog on her first caravan holiday as well. Thanks Andy. Just spent a fab week in Andy s van . 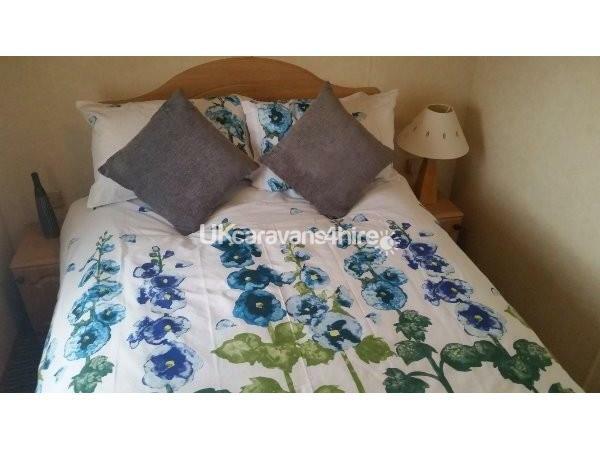 Caravan lovely very comfortable,clean and tidy,park facilities very good will definitely be back . Had a lovely week away in this beautiful caravan .Spotless clean and a bed to die for . The caravan is fully equipped with everything you need for your stay . Andy was very helpful when booking and arriving at the caravan always on hand if needed. We met some lovely people and really enjoyed our holiday . Me, my partner and dog had a lovely weekend at the caravan! It was beautifully done out and was lovely that we were able to bring our dog with us too! We will 100% be staying at Andy's caravan again. Just had a lovely week in this caravan (along with sunshine!!) Andy met us on arrival and explained how everything works which was nice. 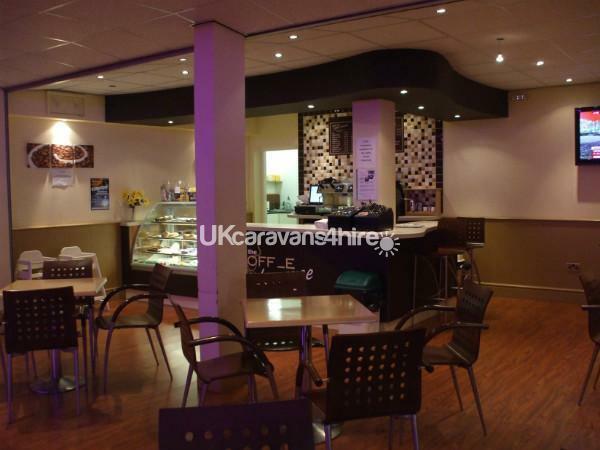 Caravan is in good location for swimming pools and Irish bar and road to the beach. Caravan has everything you could need for your stay, even games and DVD's if it should rain! Not that we needed much of it but central heating and double glazing makes this a very cosy caravan along with nice furnishings. Hopefully we will be back to stay soon. Thanks Andy. Absolutely lovely caravan. Ideal for a family with small children. 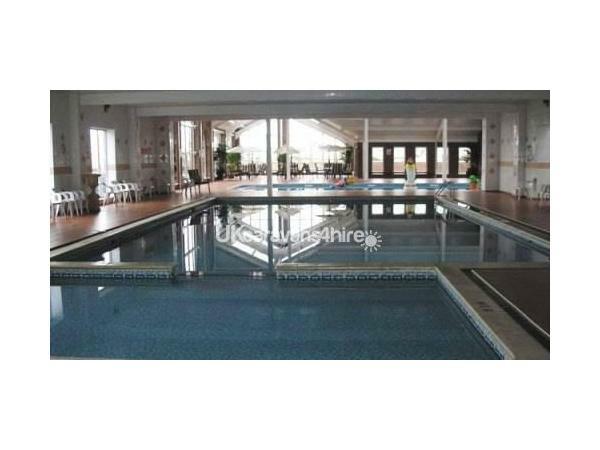 It is a nice quiet area and is only 5 minutes walk away from the swimming pool, arcade, shop & beach. Meet on arrival and shown where the van was which was nice. We would definitely stay in this van again. 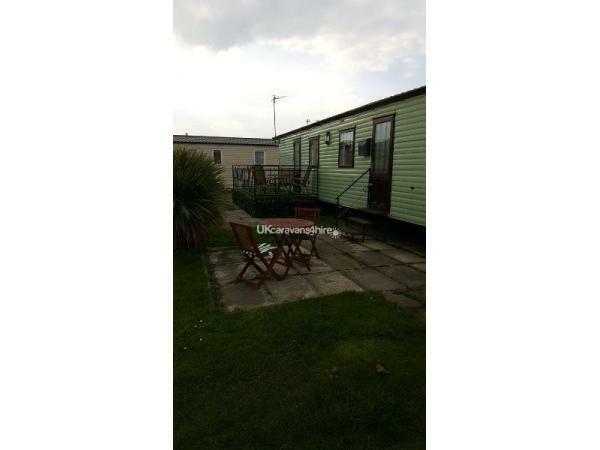 We booked this caravan for our holiday as it looked great in the photos. We were not disappointed. It was every bit as good as we were expecting. Andy met us on arrival and took us to the caravan. 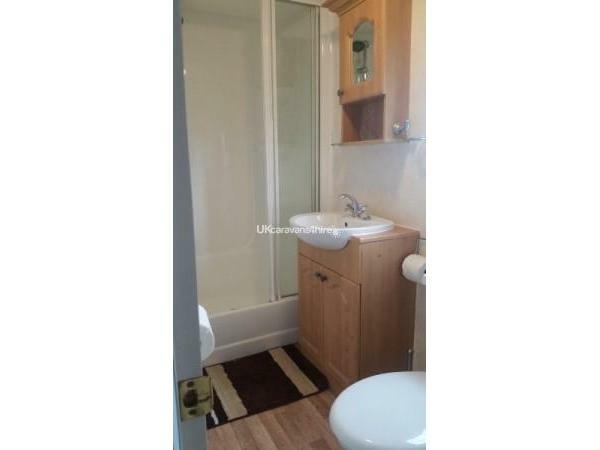 It is modern, clean and in a lovely position on the site. 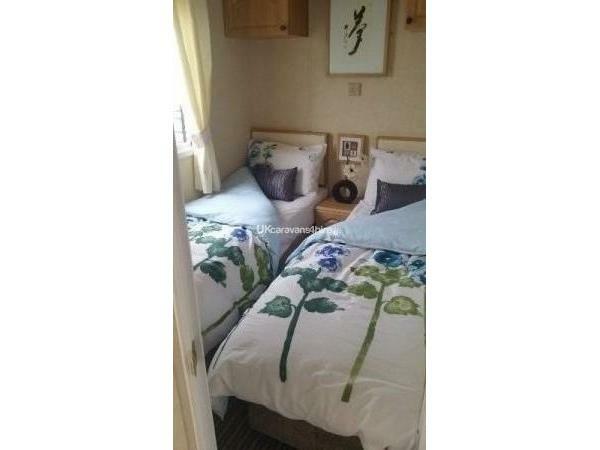 The bedrooms were spacious for a caravan and especially loved the walk in wardrobe. Had iron, ironing board, hairdryer, dvds proper seating and dining table with chairs. We particularly enjoyed the veranda and being able to sit out in the sunshine. It was an added bonus that the neighbours were so friendly especially John in the caravan facing. Thank you Andy for letting us use your caravan. Myself and my children have just stayed at this caravan. Didn't even get inside and my son said he loved it. It was lovely inside and very spacious. Fab veranda for the kids. The couple across the way were lovely too. Really hope to come back here at some point in the summer holidays. Thanks again Andy. 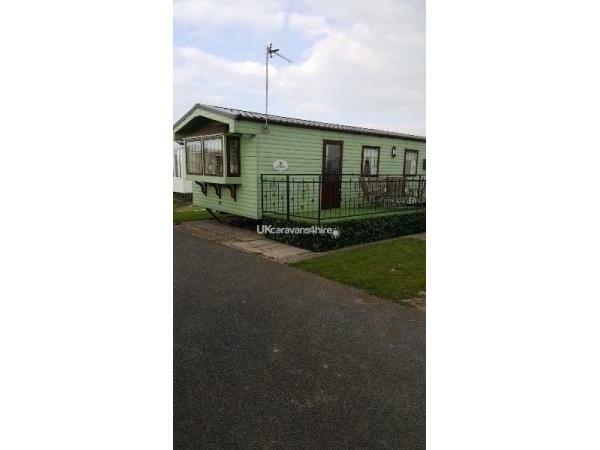 We booked this caravan as a last minute holiday over the bank holiday weekend and were amazed such a beautiful caravan was still available at such a good price! Booking was simple and Andy answered all queries by email, phone or text very promptly. The caravan is absolutely beautiful, tastefully decorated and immaculately clean with lots of lovely touches (including your own walk in wardrobe!) It really is a home from home and the fact it had two settes and a dining table rather than the typical seating in a caravan only added to the homeliness. It was also lovely and warm with central heating and double glazing. The owners make guests feel very welcome by meeting you at the park and stocking the caravan with extras such as washing up liquid, tea and coffee and condiments, iron, hairdryer and games and dvds. An added bonus for us with a young child was the child friendly outdoor verranda which was great for him to play out on safely and for us to sit out when the sun came out. The caravan is in an ideal location. It is in a very quiet area of the park but only a couple of minutes walk from all the parks amenieties and the beach. We had a fantastic stay and would highly recommend this caravan to anyone. We look forward to booking again soon. thanks for your advice there are now plenty of pamphlets for thing to do and where to go provided.